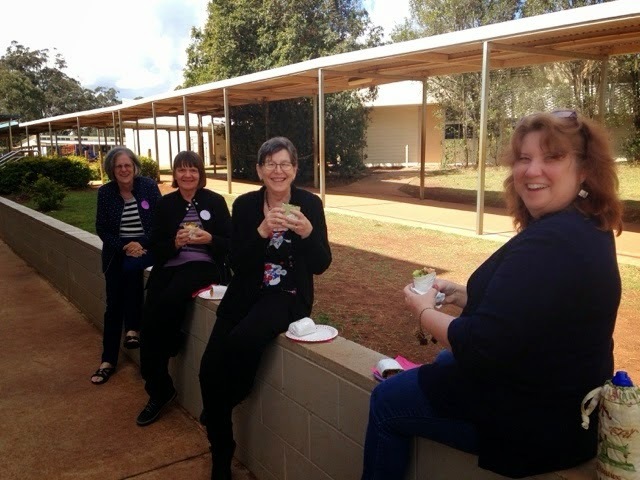 Last Sunday I attended the Stitchers Dream Day Out run by The Quilters Angel in Toowoomba. I got to catch up with many of the Sunday Stitchers girls, we had two tables near each other which made for a fun day. The designers for the day were Debbie Magee and Libby Richardson who provided two patterns for each of us. Above are the four projects, a Stitching Pillow and Memory Board from Debbie and a Folder Cover and Teddy Pillow from Libby. Libby taught us how to paint the Teddy to use in the pillow project. This is an extra pattern from Debbie, a needle holder. Here we are having some lunch. Lynda, Marilyn, me and Sandi. Photo courtesy of my friend Teresa. Forgot to take a photo of the goodies I bought and received on the day. Will show that next time I post. In all it was a great day stitching and spending time with friends, it can't get any better than that can it? Looks like a fabulous day. I love Libby's designs. Looks like you're enjoying your cuppa there, Noela! So many lovely projects. I love those butterfly needle holders. Lucky ladies... Looks like lots of fun !! it looks like a great day out with friends, glad you enjoyed it. It was a fun day Noela and lovely to catch up with you again. Looks like you had a wonderful day of stitching and catching up with friends. Lucky you....my turn in a couple of weeks and I can't wait. Oh I love that butterfly needle case and the other projects. The tables and goodie bags look beautiful! What a fabulous day. And now I know what you look like too!